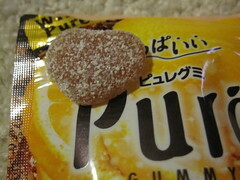 Pure is one of my favorite Japanese candy brands. If you like sour gummies, Pure is definitely worth a look. It's very cheap in Japan (around 100 to 120 yen, if my memory is correct), and pretty cheap in import stores in the USA, too. I bought this flavor at Mitsuwa Marketplace for just under $2. Since I'm not a big soda drinker, I'm not sure if I've ever had actual lemon cola. I will have to give it a taste on my next Sonic run (preferable to committing to a 2-liter bottle or a 12-pack of cans). These gummies did not smell good. The lemon scent seemed artificial and bordering on floor cleaner. Thankfully, they tasted much better than they smelled. 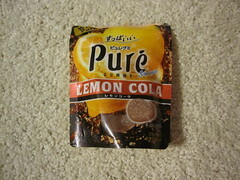 Both the lemon and cola flavors were distinct and well-executed. Both flavors were tart and tasty, and the gummies had that firm but chewy texture that I've come to love. The lemon cola flavor was different and fun, and these would be sure to please sour gummy fans. Here's yet another product kindly provided by my globe-trotting boss. This time, she and her husband went to Vietnam for a vacation filled with hiking and kayaking, but they also spent some time in larger cities. 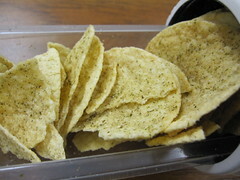 One of the snacks she brought back to share with the office was seaweed flavored potato chips. Seaweed isn't a strange flavor to anyone familiar with Japanese snacks, and the dominant flavor in seaweed snacks is typically salt. 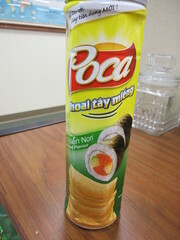 These particular chips were made by Lay's, which is called Poca in Vietnam. Several of my coworkers tried the nori chips, and most enjoyed them. The chips got a bit damaged in transit, but not crushed too badly. They smelled salty and a bit sweet. The chips had the texture of Pringles (Lay's calls their version Stax). As expected, the seaweed chips mostly tasted salty, with just a hint of sweetness and a very faintly "fishy" aftertaste. Overall, the flavor was very mild. The aftertaste was noticeable, but not unpleasant. I like seaweed, but even people who don't like it enjoyed these chips. They were pretty addictive! For my brother-in-law's birthday, my sister ordered chocolate from Chocosphere, but since they offer flat rate shipping under for orders under $50, she asked me to order some things to get the total order closer to that level. Honestly, it was hard to limit myself! 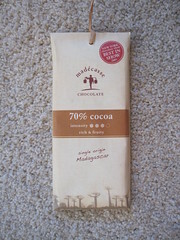 Don't be fooled by the 1997-esque web design - there is some quality chocolate to be ordered. 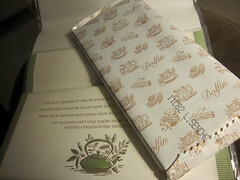 I had to try more Dolfin chocolate, so among other things, I ordered their Sencha (green tea) bar for myself and the Lavender bar for a friend of mine. That friend was kind enough to give me a bite of the Lavender bar - I never liked lavender before, but consider me converted! It was that good. Though I prefer matcha, sencha is pretty good, too. It's made from dried tea leaves and it's the most common kind of green tea in Japan (and probably the kind most Americans drink, too). In this bar, the sencha aroma was delightfully grassy and bitter. 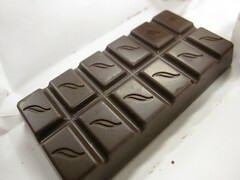 The tea leaves broke up the smooth chocolate with a slightly gritty crunch. 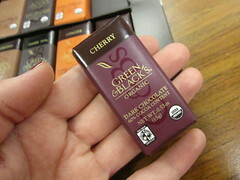 The green tea melded perfectly with the milk chocolate, which was some of the best milk chocolate I've had the pleasure of tasting (my husband loved it, too). It was smooth, not overly sticky, and neither too milky nor too sweet. This is absolutely the best green tea bar I've ever had. Although it was sencha, I found that it had more of a matcha essence than plain green tea. 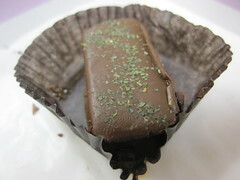 The green tea and chocolate weren't competing for flavor dominance; they were just in perfect harmony and balance. On our Las Vegas vacation this summer, my husband sat in his first real Texas Hold 'Em tournament. The stakes were pretty low (none of that televised business), but he's always wanted to try a Vegas tournament. This meant he would be at that casino for several hours, so after watching the first hand and wishing him luck, I embarked on a shopping trip. 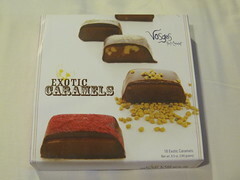 Of course, I found myself at the Vosges store inside the Forum Shops at Caesar's Palace, and after sampling three different chocolates and exploring the store, I couldn't shake my curiosity about their Exotic Caramels. Since I couldn't limit myself to just one or two flavors, I bought the whole set. 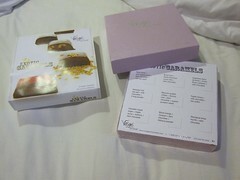 The box was a colorful smorgasbord of caramels, nine varieties in total. 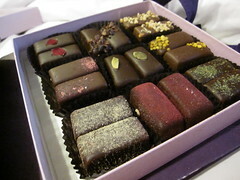 Vosges is always a splurge, and at $29 US, this set was no exception. Maybe it was just the Las Vegas spirit that compelled me to buy it. 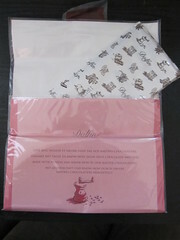 I'm not a big gambler - at least when I go shopping, everyone wins. Reading the flavor descriptions alone was worth at least a dollar. I forgot to photograph each one individually, but let's start in the lower left corner of the picture above. Canadian maple sugar + maple syrup + walnuts + dark chocolate didn't seem that exotic to me. The maple wasn't very strong, but the rich caramel still reminded me of pancakes. 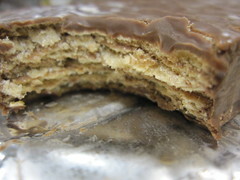 It was smooth and a little salty with a nice crunch from the walnuts. 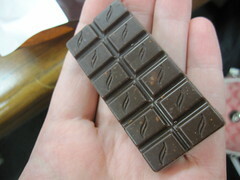 Dark chocolate was a good match, and the coating was smooth and mild. The salty-sweet balance was nice, and this one would please even a timid palate. The next caramel to the right was Blood orange + Campari + dark chocolate + hibiscus powder. That's more like it! Campari is an Italian bitters made from fruit and herbs, and I've never tried it, but Wikipedia says it is bitter, spicy, and sweet. The red coating was lovely and had a sour, floral flavor. The caramel was very soft and fruity with a citrus finish that reminded me of lemonade or jelly fruit slices. 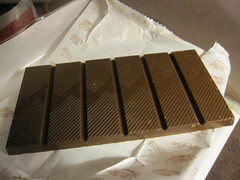 It was quite complex, and complemented by the dark chocolate coating. 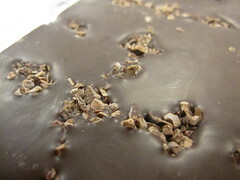 Rounding out the bottom row was Aboriginal anise myrtle + dark chocolate, and I did manage to photograph this one. After a bad experience tasting Absinthe, I lost my liking for anise, so I was wary, but the flavor in this caramel was very pleasant. The bitter chocolate stood out, but the mild licoricey anise was noticeable especially in the mid to end notes. It was surprisingly tasty, despite my distaste for anise and it being the last caramel I sampled (two months after buying the box). 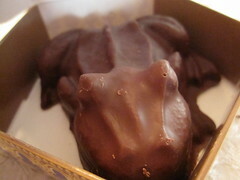 The chocolate sagged a bit over time, but the flavor still wowed me, so I doubt any real damage occurred. 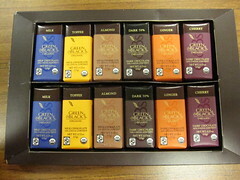 The leftmost caramel in the middle row was Hawaiian red sea salt + milk chocolate + li hing powder. Again, Wikipedia was required: li hing powder is a red powder that covers dried salty li hing mui (plums). Despite not knowing what it would taste like, the li hing was easy to detect. 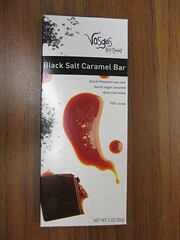 The sea salt combined with the li hing gave this caramel a complex salty-sour-sweet flavor. 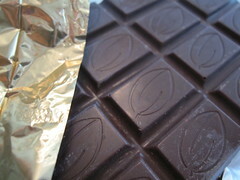 The milk chocolate was on the sweeter side, but it helped to balance the extremely salty finish. 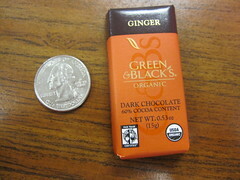 In the center, Mexican guajillo chilies + licorice root + dark chocolate + organic pumpkin seeds had the longest name. It smelled woodsy, and the dark chocolate felt deep and smooth. The pumpkin seeds were dispersed throughout the melty caramel, giving it a tender crunch. The chilies gave it a nice heat on the finish. I didn't get a sense of the licorice root, but it was still a standout piece. To the right was the strangest caramel in the collection: Tupelo honey + milk chocolate + bee pollen. It was the first one I tried because it seemed the "most" exotic. The pollen beads were floral, slightly bitter, and maybe a little waxy. The honey felt warm and was not overly sweet. It seemed very filling compared to the other caramels! Rose water + pink peppercorns + dark chocolate + red rose petal was in the upper left corner, and I loved the rose petal garnish. It was aromatic and floral, but the peppercorn gave it an intense kick! It was unexpected and delicious. 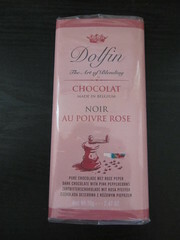 The rose was delicate but easy to detect, and well matched to the subtly sweet caramel. 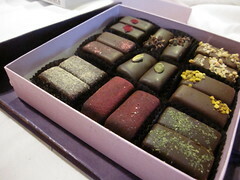 In the upper middle, Brazil nuts + South American cocoa nibs + dark chocolate had the most crunch of any of the truffles. Brazil nuts have an earthy flavor that I have never enjoyed on its own, but when mixed with sweet and creamy caramel, I had no objections. 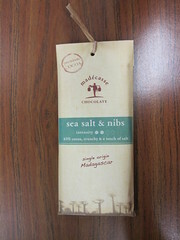 The cocoa nibs added a hint of bitter fruitiness to the nutty flavor, and all together it was comforting and easy to eat. This caramel seemed firmer than the others. 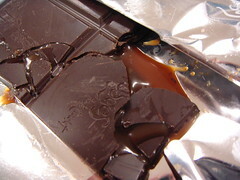 Finally, Argentine dulce de leche + Costa Rican cashews + milk chocolate was one of my favorites. Although the sources of the ingredients are exotic, this one didn't push and flavor boundaries; it was just extremely well executed. 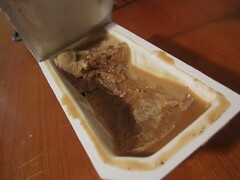 The milky caramel was refreshingly simple, with the slightly bitter nuts at the front of the flavor. It was rich and creamy, and neither too salty not too sweet. Any food lover would enjoy this set. It was such a pleasure to taste, and there is not a single bad caramel in the bunch. Words like delectable, delightful, savory, and complex easily spring to mind. Am I gushing? Yeah. Is this set worth $29? Without a doubt. I'll admit it, I was a bit apprehensive about trying caffeinated marshmallows. I love my coffee (currently drinking Trader Joe's Dark Sumatra), but energy drinks and shots just aren't my thing. Still, when it comes to food and candy, I will try anything* once. 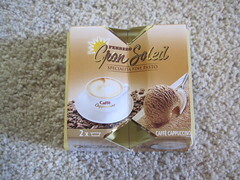 It was with that spirit I accepted an offer for free samples of Caffex Caffeinated Mallows for review consideration. As always, the samples were free but no compensation was received for this review. 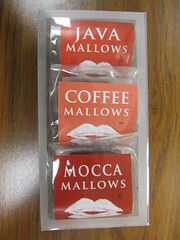 Three varieties of marshmallow came in the sampler: Java, Coffee, and Mocca. I kept putting off trying them for a morning when I wasn't drinking coffee, but that never happened. Eventually, I just went for it, sampling each kind on three different days. More on the buzz later, but I was very productive at work those days. The Mocca Mallows were the best of the bunch. 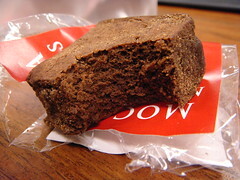 They also had 200 mg of caffeine, but I loved how this marshmallow looked-and tasted-just like a brownie. 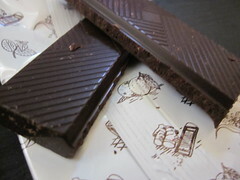 It was dense with big sugar crystals and cocoa nibs, giving it an excellent chocolate flavor. It had the mildest coffee flavor of the three, and while I still prefer a cup of coffee, I really enjoyed this one. Again, I got a pretty strong buzz. Of course, I forgot to take a picture of the beast of the bunch, the Java Mallow. I saved this one for last. It contained a whopping 280 mg of caffeine, and I was so intimidated, I split it with my husband (and neither of us had coffee that day, based on previous experience). This marshmallow was extremely bitter with a very strong, concentrated espresso flavor. It was absolutely not for me, but someone who enjoys energy drinks might like it more. Even though I split it with my husband, the buzz was intense! Candy Gurus, Energy Fiend, The Daily Nerdgasm, and Food Junk also reviewed these, and opinions ranged from love to hate. I think I fall somewhere in the middle. * I reserve the right to make exceptions to this rule. "Anything" is pretty general. Back in elementary school, when I got an allowance of 2 dollars a week, much of that money was spent on bubble gum from the grocery store a couple blocks from my house. There's just something so fun and frivolous about bubble gum, and I still blow bubbles to this day, no matter what kind of gum I'm chewing. 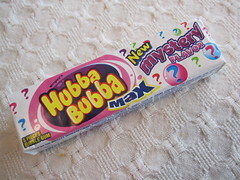 These days, I tend to stick to sugarfree gum, but every now and then, something like Hubba Bubba will jump out at me. When I bought this gum at the supermarket last week, my exact words to my husband were, "This girl I can't resist a mystery flavor." I love a good gimmick, and I think I have a pretty good guess at this flavor. 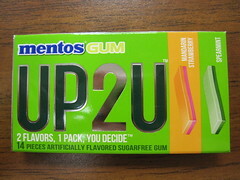 The two-toned gum smelled like almond extract. Right away, it tasted like lemonade, and as I chewed, cherry flavor emerged. My guess is Cherry Lemonade. It was juicy and sour, and not too sweet. When I blew bubbles, the woodsy cherry flavors really emerged, reminding me of amaretto and cherry Starbursts. The lemon wasn't at all like a cleaning product, just sour and tangy. 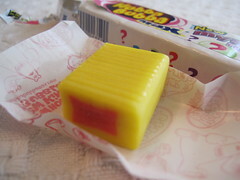 The gum itself was large and very soft, making it easy to chew and blow bubbles. I had to be careful of my glasses, because the bubbles I could blow could have easily overtaken my nose. As expected, the flavor started to wear thin after just a couple minutes, but the delicious initial favor won me over. Check out another review at Gum Alert, and from reading the comments, it seems like this "mystery flavor" is a simple re-release. Well, it worked on me. This summer, a scientist from the Italian branch of my company came to work at our lab for a couple weeks. Before she left, she shared some treats from Italy. Our lab interns warned me that they tasted weird, but I was undeterred; I thought the Amaretti macaroons looked delicious! Almond can be an intense flavor, and I think that might have been what scared off some of my coworkers. My dad (who works in the same office) sampled the cookies before me and described them as fragrant. For the record, he enjoyed them. 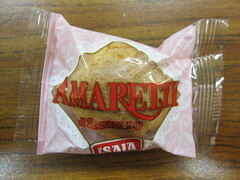 The Amaretti smelled strongly of almond extract, heavy with woodsy, cherry-like notes. 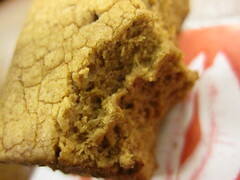 I was surprised that the cookie was very soft and had a sugar-like crunch. It chewed from a light and fragrant fluffy nut paste to a slightly bitter but very sweet finish. I got a strong sensation of amaretto, but there was no alcohol taste. 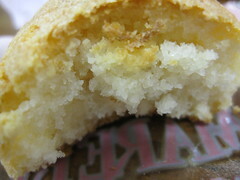 The Amaretti was moist with a gritty, soft crunch - not at all doughy. The delicate texture reminded me of French macarons, although the Italian Amaretti were much denser and had a much stronger flavor. 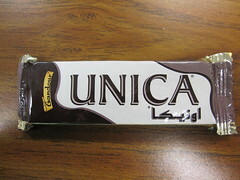 I enjoyed the heavy aromatic almond sensation, but those less keen on almonds or amaretto would do well to avoid these. Sometimes, I'm all for gimmicks. 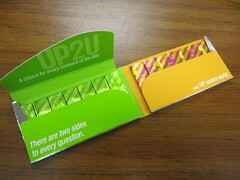 The idea of the Mentos UP2U gum struck me as quite cute: two different types of gum in one pack, so the chewer can choose between fruity and minty. 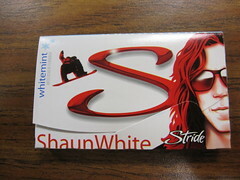 Since I'm physically incapable of resisting new gum when I see it, I bought this gum during a recent grocery store run. While a slogan like a choice for every moment of the day seems like a major overstatement, I did like the packaging. With its bold colors and metallic accents, it was stylish and eye catching. Very current, right down to the strong social media tie-ins. Being a fruity gum fan, I went for the Mandarin Strawberry first. It smelled like strawberry Mentos, and the flavor was mostly fake strawberry with hints of orange sherbet. 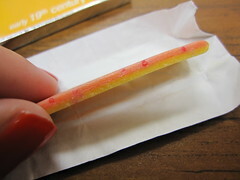 It was tart and juicy with soft flavor crystals, and the overall chew seemed a bit on the firm side. I did find the initial fruitiness to be short-lived, only a couple minutes, leaving behind a vaguely tart but not unpleasant hint of citrus. 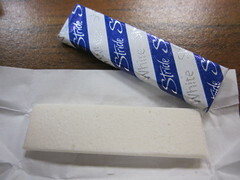 There was no mint, but it did leave my mouth feeling cool and fresh without any staleness. 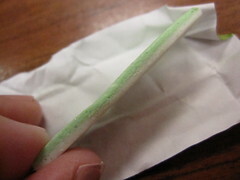 Spearmint didn't push any flavor boundaries, but as far as an after-meal breath freshener, it did a fine job. 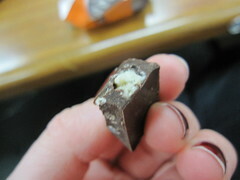 As expected, the mint flavor hung around for a while, with the stronger stuff wearing off after about 5 minutes. I chewed for about 20 minutes, and could still detect a slight flavor when I threw it away. The crunchy flavor crystals were a welcome textural addition. Again, the chew was firm, but this one seemed to soften over time. Both gums fall solidly in B+ territory. 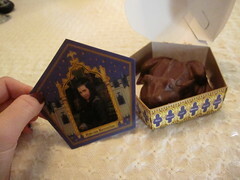 Along with candy and chocolate, Harry Potter is another one of my great loves. Shortly before the fourth book was released in the summer of 2000, I was introduced to the series, and have been a rabid an avid fan ever since. When Harry Potter and the Deathly Hallows was released in 2007, I was feeling bittersweet, but I remember thinking, at least I have the movies to look forward to. 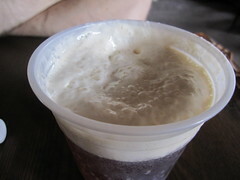 With the recent release of the last movie, I thought it'd be a good time to post a little non-review of the Butterbeer served at The Wizarding World of Harry Potter in Universal Studios Florida. My husband and I went there in June on vacation, and it was like a dream. Even though my husband is not really a Potter enthusiast, he had a blast there as well. After riding The Forbidden Journey (which was incredible) and the Dragon Challenge, we headed to the Hog's Head Pub to beat the heat. 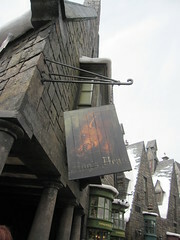 There's only one way to cool off in Hogsmeade, and that's with an ice cold Butterbeer. 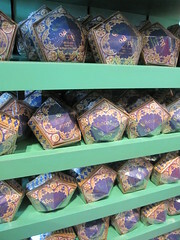 Only available in the Harry Potter section of the park, Butterbeer comes on ice or frozen, and both varieties are about $3 US. The regular, on ice variety smelled of cream and mild soda. The bartender first dispensed the amber-colored soda, then topped it with a fascinating bit of magic in the form of a thick white cream. The soda tasted like mild cream soda with hints of butter and vanilla, but the topping was incredible. It was thick and frothy and reminded me of marshmallow fluff, only smoother. It had a lovely vanilla flavor with a hint of saltiness, and seemed to expand and bubble with the carbonated soda, so that there was soda and cream in every single sip. Here's that magical topping in action! Later that evening, we returned to the Harry Potter area to ride the Forbidden Journey again, and top off the night with a frozen Butterbeer and a Pumpkin Fizz. Again, the bartender first dispensed the Butterbeer, this time a frozen slurry, and then the magical topping. 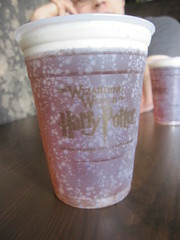 Because the topping comes out of the tap at around room temperature, it melted some of the frozen Butterbeer, dripping down the inside of the cup. The frozen Butterbeer was much denser and thicker than the regular variety. If it was carbonated, I didn't notice, and the buttery flavor was much richer. While I really enjoyed it, neither my husband nor I could quite finish it, as it was a much more filling beverage. I should also mention the Pumpkin Fizz; when I ordered Pumpkin Juice, the bartender recommended a Pumpkin Fizz instead - half juice and half club soda. Apparently, the Pumpkin Juice on its own is nearly unbearably sweet, and the soda cuts down on the sweetness. The Pumpkin Fizz was still sweet, but it was tasty and refreshing. The pumpkin pie spices were great: cinnamon and nutmeg were easily detected. 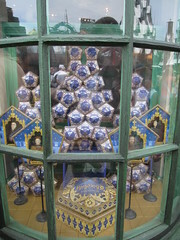 It was much easier to finish than the frozen Butterbeer! I expected Butterbeer to be more like a thick butterscotch than a fancy cream soda, but I wasn't disappointed at all. Harry and his friends drink it warm in the books, but that's not practical in the Florida heat. 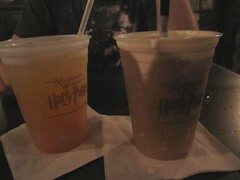 The Harry Potter-themed beverages were highly enjoyable and not terrible overpriced (for a theme park). 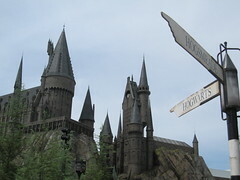 The Wizarding World of Harry Potter is an absolute delight for fans of the books and movies, but anyone would have fun there. It's absolutely worth the admission price! If you made it this far, thanks for putting up with my fangirlish raving. Are any of you Harry Potter fans? The last movie was amazing, wasn't it?